Because the text faces inwards, marking up and drawing on is awkward. 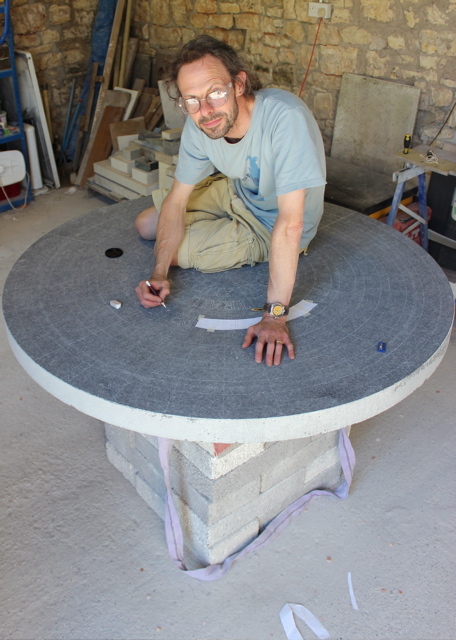 The stone is too big to reach across, so the only way to draw it on is to sit on it! So, you’ve entered the ‘blogosphere’,Iain? Nice site and so good to see you at work on something substantial for public display. Keep posting! Hi Carole. Yes, It’s taken me a while but here I am. Thanks for your encouragement. I am still getting my feet under the blogodesk so I have work to do in terms of letting my networks know I’m blogging. Please pass on my link to anyone you know who might be interested. Might see you at Greenbelt? I’ll pass the word on. Yes, I will see you at GB…reminds me, I must buy tickets!